All badges are issued by the pack. This includes membership badges, which are issued as part of the investiture ceremony or are transfered from Beavers. It is important to only wear any badges earned through acitivities in the pack. If you inherit a uniform with badges already on it, please remove them before use. Some types of badges are general across Scouting, and are transferred to the Scout uniform when a Cub progresses to Scouts. These are marked with a * below. The rest are specific to Cubs, and do not transfer to the Scout uniform. These represent membership of Scouting. All of these transfer to Scouts. All activity badges go on the left arm. 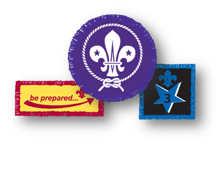 They fall into two groups: regular Cub activity badges, and staged activity badges. Regular Cub activity badges are red circles with a gold edge. *Staged activity badges are blue circles with a purple edge. These activities have stages covering all sections of Scouting. When all six have been earned, the *Chief Scouts Silver Award is given. This is a silver oval, and also goes on the right breast. A few other badges may be awarded, but are rare.